William F. Buckley, Jr.’s greatest triumph was over Communism, that cruel system of “Liberalism in a hurry” which enslaved half the world, cowed half the rest, and thoroughly poisoned the high intellectual endeavors of man down to this very day. In his lifetime this wicked system was overthrown, and praise God for it. The walls came tumbling down. So upon learning of the great man’s death, I thought it proper to return to his work under this head — to his work back before it was a triumph but rather an arduous struggle, demanding intellect, dexterity and perseverance. It was these, exercised by Buckley and all the great Cold warriors, which made the triumph possible. I cannot think of a single word James Wechsler, a spokesman for American liberalism and a product of it, has ever uttered, or a deed he has done, that could be proved to have given comfort to the slaves behind the Iron Curtain, whose future as slaves would be as certain in a world governed by James Wechsler as the future of slaves in Atlanta would have been in an America governed by Jefferson Davis. We have here before us, in a sense, the very Verdict of History being read. Buckley was right, and the Liberals were wrong. More precisely: Buckley was right, and the Liberals who weren’t wrong, joined him. We call them neoconservatives now. The rest were wrong. Eighteen years ago he and I [John O’Sullivan, former Editor of National Review] were here on a National Review Institute political tour of Eastern Europe. This was only a year after the collapse of the Berlin Wall and the “velvet revolutions.” Because of Bill’s leadership in the anti-Communist and conservative movements, everyone wanted to meet him. New ministers, heads of new political parties, and editors of old national newspapers (with new editorial lines) told him of how they had read smuggled copies of NR during the years that the Communist regime condemned them to work as stokers and quarry-men. It is very easy to forget how unpopular anti-Communism was with the intelligentsia of the West. It is very easy to falsify the drama of the Cold War by the pretense that there was ideological unity at home. In fact there was a whole movement of men, the primary spring of whose politics was alarm at the stridency of the adversaries of Communism. It is still true that our intellectuals wring their hands in shame at the ghastly Black List. Just last week I turned on PBS to behold some of the old moping — this time about poor Pete Seeger, banished from network television for 17 years for being a commie. O the humanity! It is still true that sympathy for Communism is no bar to laudatory celebrity or professional advancement. Lunatic tyrants like Che Guevara and Chairman Mao really are still admired by popular ignoramuses. Thank you, Mr. Buckley (were this a speech, my voice would crack), for kindling in us that hope. As with all great Conservatives, it was gratitude that moved him. A true patriot and Christian man is gone, and — in the sort of language he loved — we are bereft. Requiescat in pace. 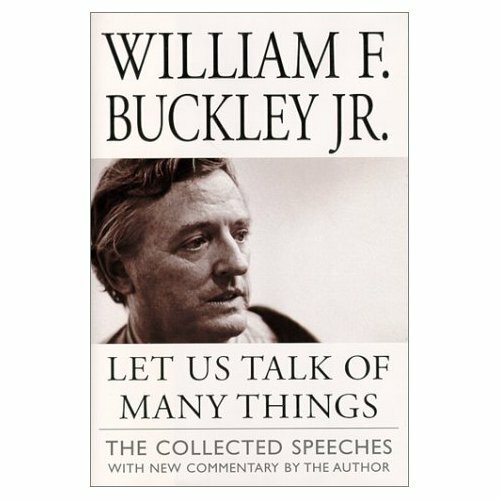 The quotes in this post are all taken from Buckley’s collection of speeches, Let Us Talk of Many Things (pictured above), a fine introduction to him as a writer and a man. I don’t see why every American shouldn’t own this book. Excellent post, Paul! Just now got to read it. We must never, never forget the evil that was Communism and the triumph that was its fall. I was...unnerved to see on a conservative blog recently the opinion that the winning of the Cold War was a "liberal accomplishment." I would prefer not to give the liberals that credit. I would also like to line myself up with conservatives who are proud of being anti-communist and who are not ashamed that being anti-communist should be thought part of being conservative. Hello, I located this site by on accident when I was exploring on Google then I went on your website. I must tell you that your web site is very interesting I really like your theme! Currently possess a lot of free-time at the moment to fully look through your website web sitebut I have bookmarked it. I will be back in a day or two. Thanks for a great site.